Globeracer is a holistic solution for spinning classes. 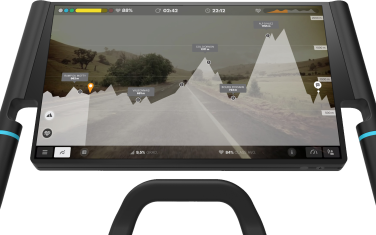 It consists of top-quality motivating films, virtual cycling races and different spinning challenges, all integrated as one complete system. It’s a bold step into emerging technologies and is aimed at fitness centres, so that they can conduct efficient, simple and highly appealing spinning classes for their members. The system combines video and audio with gamification, and a digital interface for both instructors and practitioners in the audience. It creates a feeling of cycling on country roads, or alternative terrains. On the big screen, users can follow the landscape, whilst tracking their personal development and monitoring their progression, pulse and other indicators. 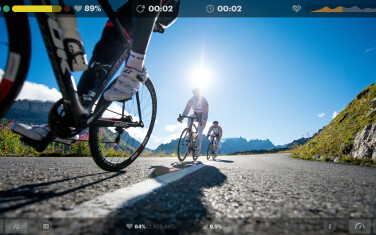 Users can also compete in virtual challenges as part of a team or amongst their friends, whilst still using all their existing gadgets and devises. EGGS has been the main provider of design services for Globeracer. Merging all our design disciplines, we designed the fitness concept, all digital user interfaces, the physical instructor console and the ankle strap that captures data during each race. 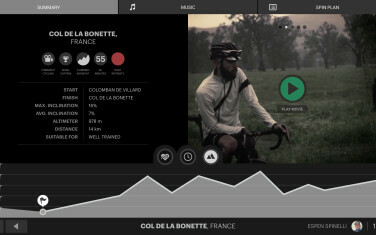 As the cycling films are visually strong, the infographics, icons and graphic design have all been developed to look modern and minimalistic, so as not to visually overpower the films. As spinning classes usually take place in dimmed lighting conditions, we have taken great care in choosing the right colour balance against a dark background, so as not to strain the eyes of the spinning participants. The design process has resulted in a relevant, innovative and user-friendly fitness concept. Globeracer has been a serious market contender in the fitness business since 2004 and was one of the first companies to introduce projectors and entertainment systems into spinning classes. This latest version of Globeracer showcases a whole new spinning experience. Worldwide, there is no similar concept that matches Globeracer.